The safe and reliable charging of electric vehicles is also directly related to electrical safety in the building installation and the charging stations. The new RCMB42…EC series AC/DC residual current monitor the is used for residual current monitoring on AC charging stations for electric and plug-in hybrid vehicles in which DC or AC fault currents are likely to occur the value of which is constantly greater than zero. 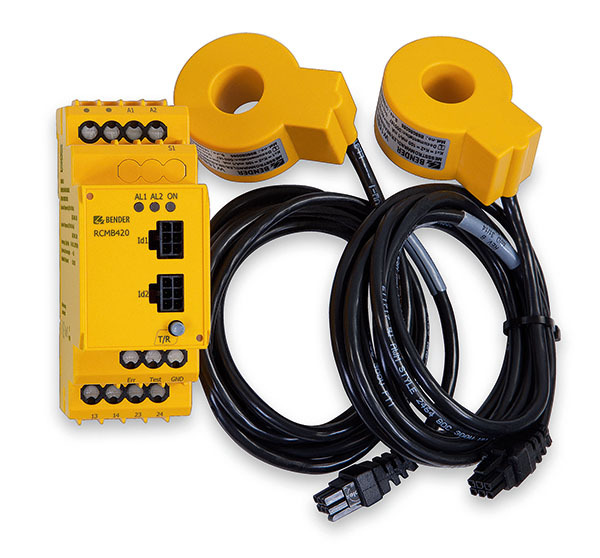 The residual current monitoring is undertaken using measuring current transformers connected externally. During this process the effective value of the DC components in the residual current and the AC components below the cut-off frequency is formed. Alarm relays indicate if the limits of IΔn = DC ≥ 6 mA and/or IΔn = RMS ≥ 30 mA are exceeded. Both items of information are signalled by the same relay. After actuation of the test button on the front panel, the integrated microcontroller generates a test current that comprises an AC signal with superimposed DC component. The magnitude of the test current is designed such that the response value is exceeded and therefore both alarm relays are triggered if the device is functioning correctly. Prior to each charging process, it is necessary for the monitoring device to carry out a self-test and offset measurement. During this process the safety-related residual current monitoring is tested. It is necessary that the charging process is deactivated for this purpose. This function increases safety and prevents long-term drift on the residual current measurement. The fault memory can be selected using the integrated sliding switch S0. If the fault memory is enabled, a fault that occurs must be reset manually via the device test button or a digital input. If the fault memory is disabled, the reset occurs automatically as soon as the residual current drops below the response value of DC 6 mA/RMS 30 mA less the hysteresis of 20 %. The RCMB42…EC is available in three variants matched to the related application. The two-channel device RCMB420EC is intended for usage in charging stations with several charging points, while the single-channel RCMB422EC is essentially intended for usage in a wall box. A third variant, the RCMB421EC, is also in planning, this device measures the residual current using a single-channel process, however it also signals if the charging current exceeds 32 A.